Divergent By Veronica Roth, The Next Hunger Games? So you just finished the third book in The Hunger Games and you just don’t know what you could possibly read next that would be half as entertaining! Don’t despair! Divergent is here and it too is an exciting page turner with lots of twists and turns. Like The Hunger Games, Divergent takes place in a dystopian world and therefore falls under the category of dystopian novels, a genre I know little about. The Time Machine written by H.G. Wells in 1895 is considered to be dystopian science fiction at its best. Some other classic dystopian books are 1984 by George Orwell, Lord of The Flies by William Golding, A Brave New World by Aldous Huxley and one of my daughter’s favorite books of all times, The Giver by Lois Lowry. Meet Beatrice Prior, the feisty teenage star of Divergent. The world Beatrice was born into is divided into five factions, each representing a different virtue. Beatrice belongs to the Abnegation faction (the selfless). At the age of 16 each child is required to take a simulated aptitude test to determine which faction suites them best. There is no way to prepare for this test as no one actually talks about what happens in the testing room and once the test is finished, no one dares to discuss the results until Choosing day, the day each child announces to the world which faction they choose to commit their life to. Would Beatrice choose to remain with her family in the Abnegation faction, or would she choose to leave everything behind and join the Candor Faction (the truthful) or The Amity (the peaceful) or the Erudite (the Intelligent) or even The Dauntless (the Brave)? What could it possibly mean to be a Divergent and why was everyone afraid to actually say the word out loud? Divergent is a quick and most importantly fun read. There is only one major problem with reading this book. When I finished, I immediately tried to download the second book in the trilogy…yes like The Hunger Games it is a trilogy… only to find out that it has not been released yet. I can hardly wait to find out what happens to Tris (formerly Beatrice) and her friend Four. Divergent’s Tris and The Hunger Games’ Katniss have a lot in common and would probably be the best of friends! I agree. 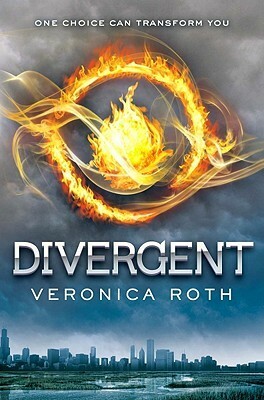 Divergent is a quick, fun read and I hear that it is being made into a movie. I had heard about Divergent, but i thought that it was a young Adult book and wasn’t sure if it was too juvenile. Thank you for the review. I think I am going to give Divergent and The Hunger Games a try.